"A bird dating simulation game!" Everyone knows how nerve wracking it is to start your first day of school, even more so when your school is St. Pigeonations and you are the only human student. I’m not one to judge but if you go to a school consisting entirely of birds, because you are a bird lover and I wish I meant that in the ornithology sense of the word but sadly it’s literal. 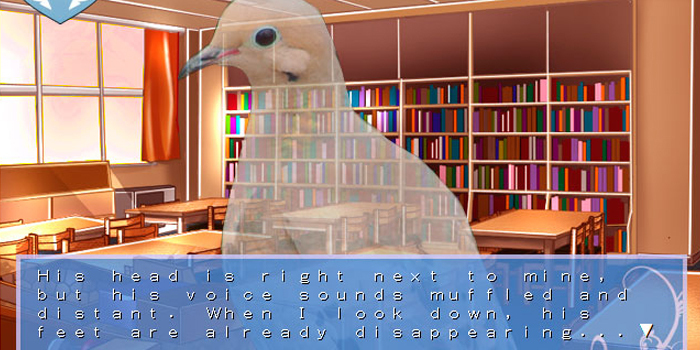 The idea behind Hatoful Boyfriend is to integrate yourself in the school, make friends and then to start dating some of the pigeons. Some of the birds are fun and friendly some are stuck up and pompous, some are pervy like the school doctor, who is also a pigeon but I just couldn’t find one I was interested in, some of us are just not lucky in love! 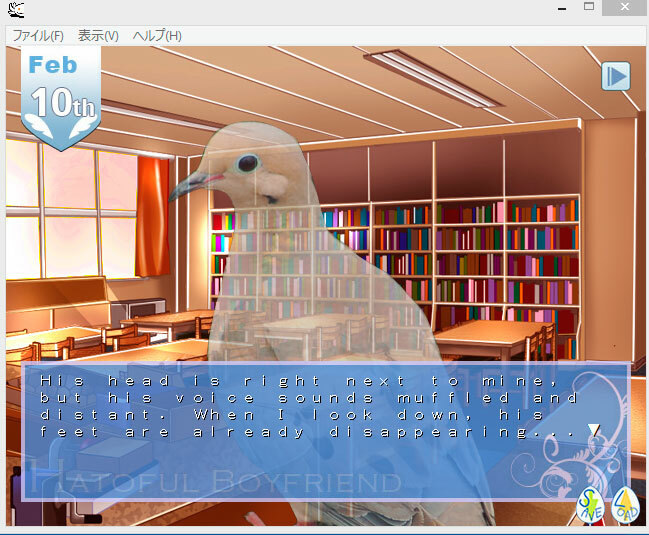 Hatoful Boyfriend it has to be said is somewhat strange, it is a text based game where you occasionally make decisions, for example as to which class you will take that day, music class will increase your charisma where as gym will increase your vitality. At times you will have opportunities to invite different birds on dates and this can shape the future of your story. 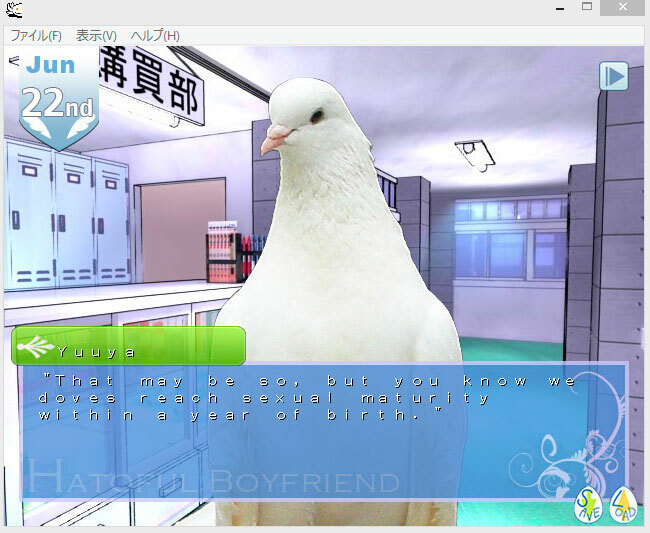 Apart from learning a little about different types of doves there is not much to be taken from Hatoful Boyfriend Download, the pictures and text are mostly cartoon backgrounds with a photo of a pigeon or dove placed in front when having a conversation, there is not a lot of multiple choice so at times it can feel like you are reading a book and the repeated play on words of nobirdie or everybirdie while cute at first becomes tedious after it has been said so many times. There is no real interaction in the game other than to click for the next bit of text to appear and making the occasional choice of which class you wish to take that day or which of your bird friends you would like to invite on a date. I’m not really sure what market this game is going for I suppose as it addresses you as Miss I’d expect the demographic is a younger feminine audience but what satisfaction you can actually derive from this game remains unseen, it’s very slightly educational but what worries me and an issue that should really be explored more is the fact that you are a human who is attracted to birds and not just that you have been allowed to be the only human student at the school, perhaps the sequel should be a game where the protagonist goes to the psychiatrist for this unusual attraction to birds. There is no real gameplay to be discussed here with it being a text game and there is no sound, the graphics are simple and not intriguing and the game itself is just strange. Maybe if you are a keen ornithologist or peristerophile (a bird lover) then perhaps you should check this game out as it may appeal to you, as for the public in general I’m not so sure.